The highway from Yangon to Mawlamyine heads east across the irrigated plain of the Sitang. 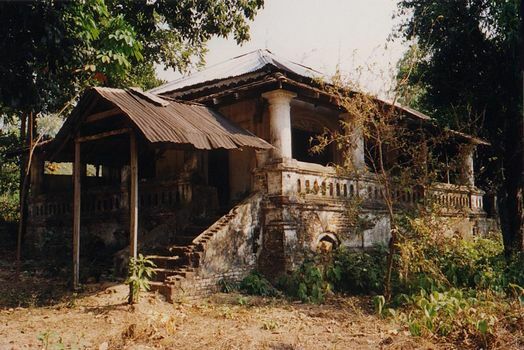 It passes Pegu, where a huge sleeping Buddha, found overgrown in the forest by the British, now rests under a shed roof that they put up to protect it. 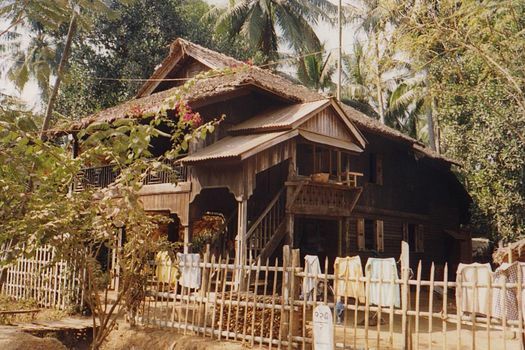 Then the road turns south, staying close to the Andaman Sea all the way to Mottama (colonial Martaban). 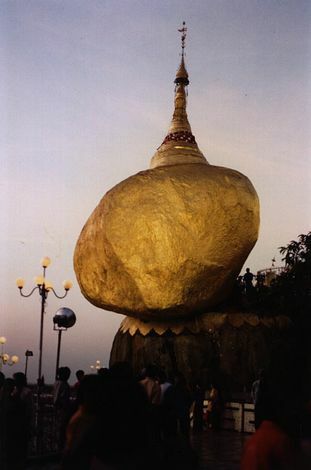 Along the way the Golden Rock is the big attraction, but there's more to see than that. 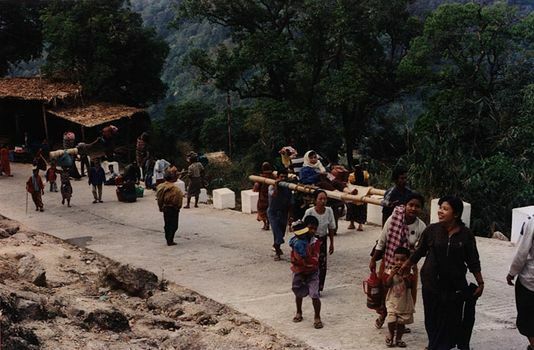 Trucks run up and down the mountain, but the last bit is by foot or sedan chair. 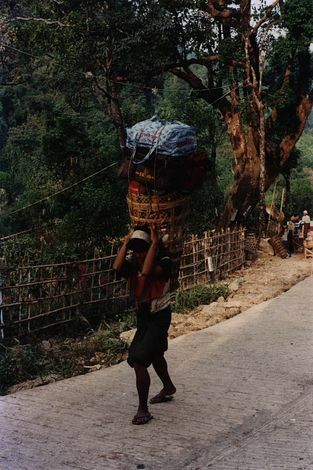 Porters carry supplies to the many shops and restaurants up top. 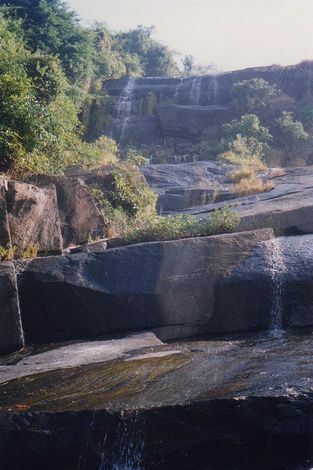 Farther south, past Thaton, there are some spectacular natural features, such as this waterfall, its flow much reduced by an aging hydroelectric power station. 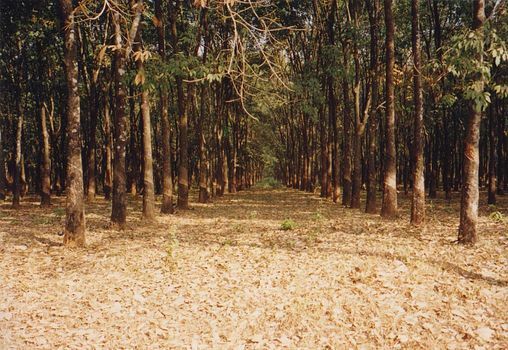 This is rubber country, too, and has been for a century or so, since seeds of the Brazilian rubber tree were smuggled from Brazil to Britain. The diagonal slashes are scars of previous tappings. A bit closer, with a tapping-cup on the tree in the foreground. 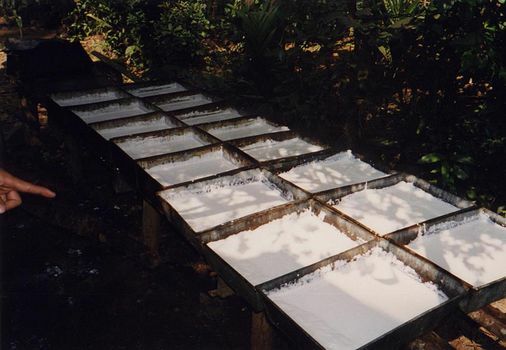 Behind a small house, pans hold acid-treated sap collected from a small plantation to the rear. 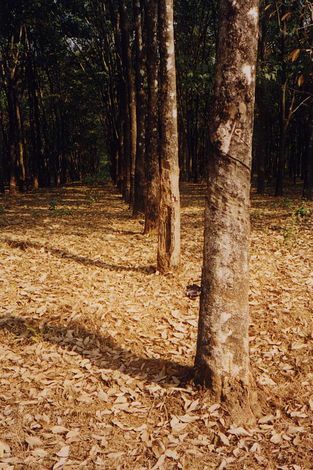 Behind hundreds of road-hugging houses there are not only small rubber-tree groves and pans to treat the sap but also rollers like these, which turn out pillowcase-sized sheets of latex, each the thickness of a sheet of cardboard. 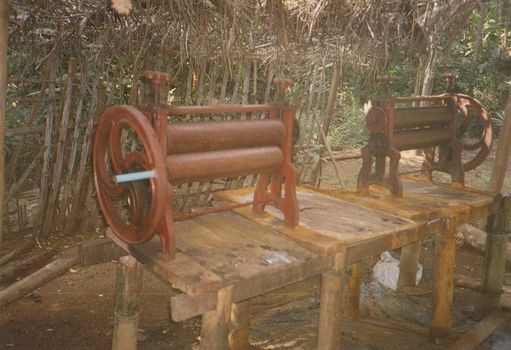 The sheets, which are stacked and sold to brokers, provide the family livelihood. They re very tough, somewhat sticky, and unpleasantly smelly. 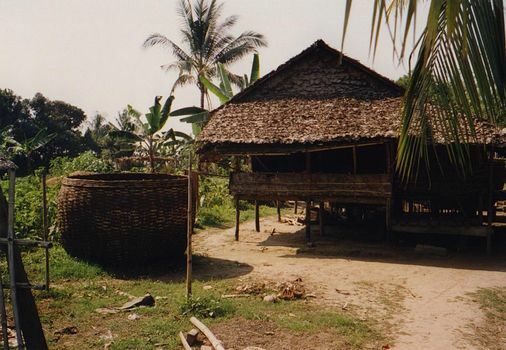 A typical local house, on posts and with the ubiquitous and immense basket for rice storage. 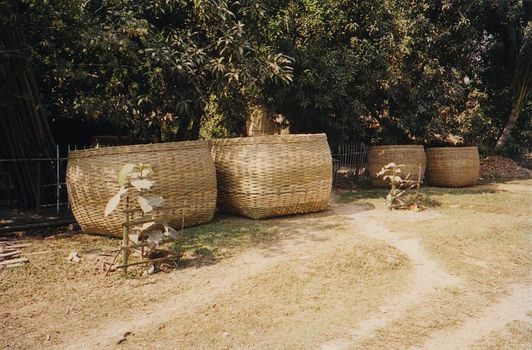 A subsidiary industry: making the baskets. One such house, newer than most and a bit fancier. 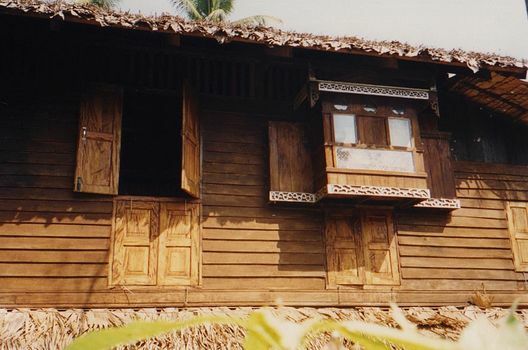 This is historic teak country, of course. Some families do pretty well, though less so than the leaders of the rubber industry did in colonial times. 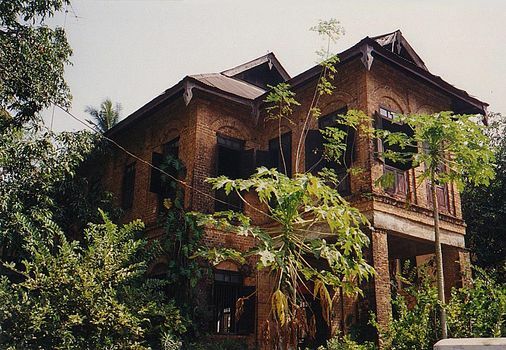 Papayas grow in the front yard of an old brick house. 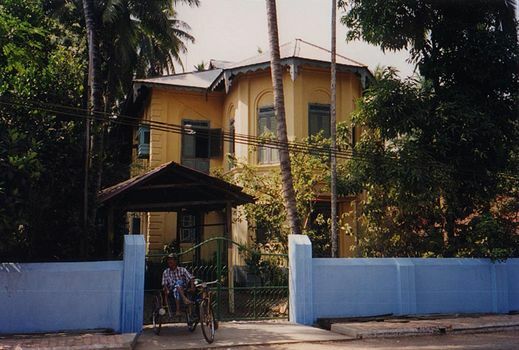 The blue wall would likely have scandalized the original occupant, accustomed to PWD ocher. 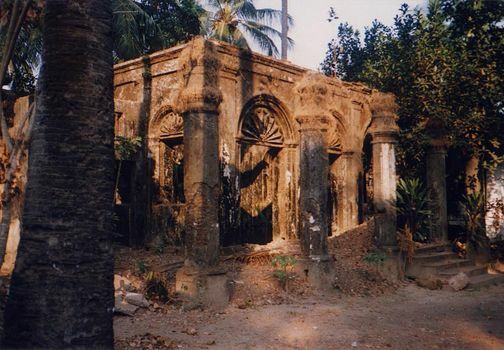 A lot of colonial-vintage places are in very poor repair. 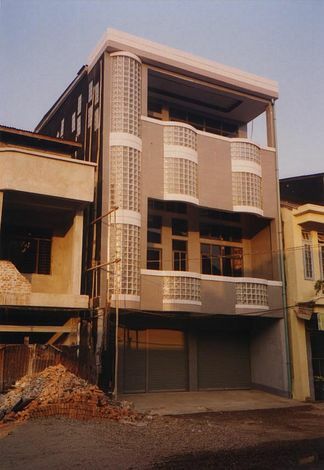 Still, there are also new houses along the road, including this glass-brick one in Kyaikto.